The New Hampshire Association Of Criminal Defense Lawyers (NHACDL) is a voluntary, professional association of the criminal defense attorneys in the state of New Hampshire. NHACDL is the only statewide organization devoted to criminal defense. More than 300 members belong to this organization including both private attorneys and public defenders practicing in state and federal court. NHACDL estimates that its members include nearly half of all practicing public defenders and most members of the private bar who are New Hampshire criminal defense lawyers. As an affiliate of the National Association of Criminal Defense Lawyers (NACDL), the NHACDL's stated mission is to "ensure, safeguard and promote the effective assistance of counsel in criminal cases, to support the lawyers this work, and to preserve the fairness and integrity of the criminal justice system." 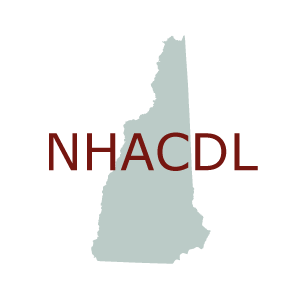 NHACDL monitors pending legislation and maintains a lobbying presence in Concord, New Hampshire, during the legislative session. The opportunity for referrals from the "find a lawyer" feature on the NHACDL website which allows other attorneys or members of the public to search for either state court practitioners or federal court practitioners in a particular county in New Hampshire.